HCM CITY (VNS) — HCM City authorities are speeding up the relocation of polluting factories from the downtown area and stepping up efforts to protect canals – many of which have been cleaned — to improve the living environment. Tat Thanh Cang, deputy chairman of the city People's Committee, also recently called on the Department of Natural Resources and Environment to work with the police and local authorities in Districts 8, 9, Thu Duc, Tan Phu, and Binh Thanh to closely monitor factories for pollution. The city is determined to move the remaining six seriously polluting companies from the downtown area, a task it has been trying to accomplish for several years. "Authorities' lack of determination has caused the shift to go on for many years," Thoi bao Kinh te Viet Nam (Viet Nam Economic Times) newspaper quoted Dao Anh Kiet, director of the department, as saying. Following a recent meeting Cang resolved all the problems related to the relocation of polluting companies. According to the department, there are another 700 less polluting factories that need to be moved out. The plan is to move all polluting plants to industrial parks that already have waste treatment plants. After several years of work and a huge sum of money was spent, many of the city's canals have been cleaned up and even become waterway tourism routes. But people living along the canals continue to throw rubbish into them and many factories keep releasing untreated water into them. Local authorities have increased patrolling of the waterways and started to educate residents about environmental protection. 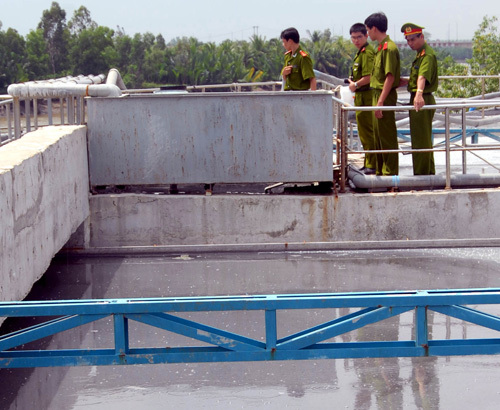 Furthermore, in the second stage of a sanitation project for the Nhieu Loc – Thi Nghe Canal, a US$300,000 wastewater treatment plant will be set up with a capacity of 400,000 cubic metres a day in Thanh My Loi ward, District 2.